In ‘Device is Secure‘ I had a case where this was a false alarm. But recently there has been a report in the Freescale Forum that this can be a real problem with the Freedom KL25Z board I’m using too. I was not able to reproduce this on my end, so a reader of this blog who sent me a binary file to reproduce it. I knew my board is fine (power supply/etc). It is just that program I have flashed to the device. Looking at the schematics: That R25 resistor which can or cannot be on the board did not make a difference. But: I have ordered the JTAG headers for the Freedom board, and they have not arrived yet, so no way to use the Multilink :-(. I knew from the Freescale forum that P&E had released new drivers *after* the MCU10.3 beta release. And indeed, they solve my above problem :-). That ‘device is secure’ shows up, and after one or two unsecure attempts I have access to my board again :-). ❗ This patch is for MCU10.3beta only! I assume it is *not* working for any other CodeWarrior release! This is provided ‘as is’ :! :, so make backups as necessary (noted in the steps below)! Close Eclipse/CodeWarrior if it is running. This folder has a subfolder named ‘gdi’. Zip that folder (as a backup). Then remove the ‘gdi’ folder. It is *not* enough to rename that folder, as CodeWarrior still might load the DLLs. Or move that folder completely outside of your installation folder to a place somewhere else. Download the zip file from here to your machine, and copy it into the folder from above step (<MCU10.3beta>\MCU\bin\plugins\support\ARM). Restart Eclipse/CodeWarrior. Now you should be able to unsecure the board again. At least it worked for me :-). This entry was posted in Boards, Kinetis, KL25Z Freedom Board, Tips & Tricks and tagged Debugging, Flashing, KL25Z Freedom Board, P&E, Tips&Tricks by Erich Styger. Bookmark the permalink. Hello, I want to thank you about the work you have done ! The unsecureing procedure worked for me ! But now I have a problem doing debugging. It’s failing to initialize the target! If i use the MSD_Bootloader to load srec files every thing seems to work ok, but not if I want to debugg a project ! I have replaced back the gdi folder with original one and the problem persist ! keep in mind that you need to load a different ‘applet’ into OpenSDA: one for debugging and one for MSD bootloading. Have you loaded the DEBUG-APP_Pemicro_v102.SDA file on the K20? I ran into the “secure device” problem early this morning. After replacing the drivers, the board resumed working. Now, the same thing has happened again, and replacing drivers again is not working. I will try connecting the board in my home computer tonight (problems have happened in my work computer). By the way, I have tried the debugger applet with CW10.3, and I have also tried the MSD applet, dragging a precompiled file. Nothing worked. In case you have set the ‘disable mass erase’ bit in your download, then you have definitely bricked the device: game over 😦 and you won’t be able to recover the microcontroller. Have you set the security bits AND the disable mass erase? If you want, you can send me your S19 file and I’ll have a look. Well I do not remember which test program I was downloading when that happened. I tried one short program I wrote myself to change LED color… it worked fine… then I do not remember if I used the debugger, or changed to the MSD. Anyway, I had just used default settings. I do not know where I set the security and mass erase bits. Could you tell me where I can set them on CW10.3, so I can check on my project? After trying hard to remember what I had done wrong, I think I know what I did. I tried to download an ELF file using the MSD applet. Maybe it has messed up the security and erase bits. The board does not accept programming through CW10 and the debugger applet, and also does not accept SREC downloads. OpenSDA bootloader works fine. I tried that in 2 computers. I am going to buy a new microprocessor and substitute it on the board. Maybe you could write something on how to avoid messing up with these processors. That would be very helpful. I have heard that a next version of the MSD bootloader will check if the disable mass erase bit is set to avoid such a problem. As about how to find out if that bit is set: the best way is to inspect the S19 or intel hex file. If I find time, I’ll describe how this can be done manually. Thanks for posting this solution. I spent almost all afternoon trying to figure this bug out. Can I unlock my device using IAR & OpenSDA. I am working on FRDM-KE02Z board and my device get locked. Can you please help me out? 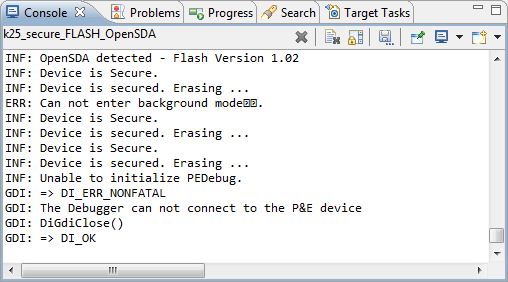 I recommend that you load the latest P&E firmware on the board (see https://mcuoneclipse.com/2013/12/14/new-pe-opensda-firmware-v114/) and then use CodeWarrior for MCU10.5 to unlock the board. MCU10.5 with P&E has updated the unlocking. At least for my boards, CodeWarrior was able to unlock all of my boards (except one, where as well Keil and IAR failed). Otherwise I suggest that you submit a ticket to IAR. I am trying to program a custom board (KL04) via the Multilink.It worked fine, but then it shows the “Device is secure.Erase to unsecure”.I keep pressing Yes. AFter doing this twice the “Multilink” not connected is shown. There was another board that was doing the same. But, its now, surprisingly working,except this 1 board. I tried the Processor halt utility. Still no luck.Uninstalled/installed PE drivers. No luck. Also, no where in the code have I modified that register (FTFA_FOPT or any such dangerous registers:) . Infact CODE WARRIOR warns you if you make any changes to such registers.). Also, is there any way I can ensure such a message/error does not occur in any future boards. Can this be done via s/w code or so. I saw in a site that I can look at the Binary files at the location 0x40C. How can I look at 0x40C. Kindly help me out. This is a disaster as 1 board is beyond recovery. How do I analyse this. Thank u sir. I suggest you check if the clock of your board is working properly, and that the supply voltage is correct. I have seen ‘secured’ messages for all kind of things where the debugger is not able to talk to the device. Another common cause is that you programmed the wrong file in error to the board. In the worst case, your board is lost. I have experienced that that CMSIS-DAP with OpenOCD is not a good choice to unlock a locked board. P&E and Segger was what working for me. Using OpenOCD in my cases either always failed, or only worked after many attempts (as in your case?). The reason is probably that OpenOCD is much slower, and therefore misses the small window to regain access to the chip. Attempting mass erase without hardware reset. This is not reliable; it’s recommended you connect SRST and use “reset_config srst_only”. MDM: Chip is unsecured. Continuing.